My eyes dart, rapidly checking both the view from the cab but also a dashboard of signals; my left hand nervously grips a handle that goes backwards and forwards — and right now it’s pushed far forwards, enabling me to force a 160,000 kilogram train to speeds upwards of 80 km down a track between Rideau and Parliament LRT stations. Suddenly, my stomach sinks: up ahead there’s a deer on the track. Worse, it’s standing next to a drunk who’s swaying back and forth and who might, at any moment, topple over onto the track. Panicking, I slam the handle back, hoping to slow the train in time to avoid hitting both. Taking my place at the helm of the simulator is Peter Dornan, 58, an experienced OC Transpo bus driver and one of 35 EROs (electric rail operators) training in the simulator, which is housed inside a separate building that’s next to OC Transpo’s Belfast Road HQ. He’ll be one of the first cohort of EROs on the trains this fall. After Dornan unlocks the doors into the Confederation Line cab, I squeeze next to him and the consul, outfitted with knobs and gauges like the cockpit of an aircraft. 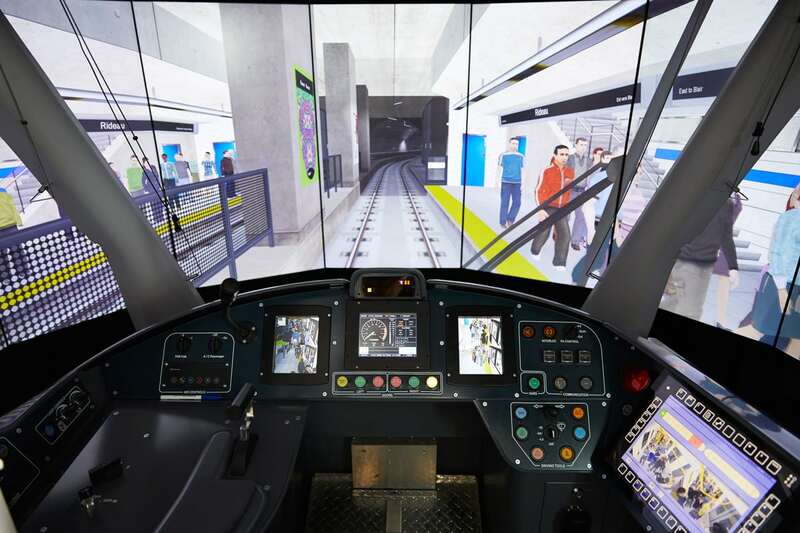 The cab’s ‘windows’ are in fact a digital — yet highly detailed — concave screen that shows we are at the Pimisi Station, near Booth Street. People are standing on the platform milling about as Dornan closes the doors and exit the station. With his left hand, he pushes the handle forward while positioning his right above a series of buttons — the most important being the ‘big red shiny button’: the emergency stop. As we pull out of Pimisi, I brace myself against one of the walls because it feels like we’re moving, even though the simulator is not physically in motion. My mind is tricked because, as Dornan notes, what we’re seeing is “as the train track appears in real life.” I almost feel motion sickness, but Dornan, who’s been at this since October 2017, doesn’t react. “Some of the operators got motion sickness until they got used to the simulator,” Dornan says in a thick Scottish accent. Approaching Bayview Station, Dornan looks for the station indicator sign, which is located in the dividing wall between the east and west tracks. He’ll attempt to line up that marker so that it appears in the centre of his left-side window (right if he were driving west) — this will align the train perfectly to the platform. While it might seem simple, trust me, it’s not (I failed twice). I watch as Dornan monitors a variety of signals, controls the speed, and watches out for the unexpected. Dornan, who’s been training as an ERO, is a new kind of ‘driver’ — new, at least, for Ottawa. As such, we wanted to know more about what he’ll be doing and the kinds of challenges he’ll be facing. And since 10,000 of us will be travelling per hour at peak times somewhere along the line, it might just help us feel more secure knowing what’s happening going on inside that cab. What else might happen — jumpers? 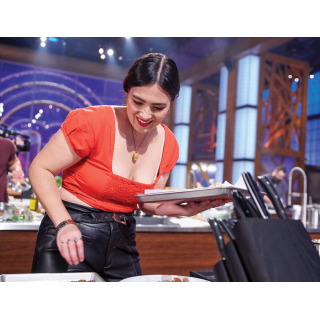 “I’m being trained for all kinds of scenarios… At some point in your career, the possibility exists that this will happen. I think there’s not much you can do if someone is determined to do that. We have to be aware at all times that this possibility exists and, if possible, stop the train before it happens. At this point in the training, it’s more about how we, as human beings, deal with it. I’m not any more anxious about this possibility than when I was driving a bus for 36 years. Restricted access to the driver? “The doors will be locked (to the cab where the driver sits) at all times when in operation. 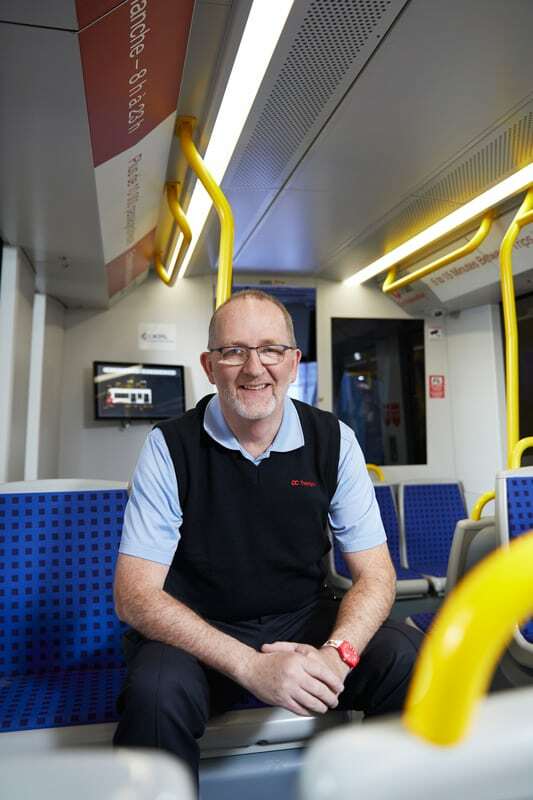 There will be instances where I will have to leave the cab — for example, if there is a problem with a door or if there’s an issue on the track, but anytime I have to get out of the cab, I need to contact control [O-Train headquarters]. I have to ask them for permission to leave and explain why it’s necessary — this includes needing to go to the washroom! What about disputes, harassment, and medical emergencies? 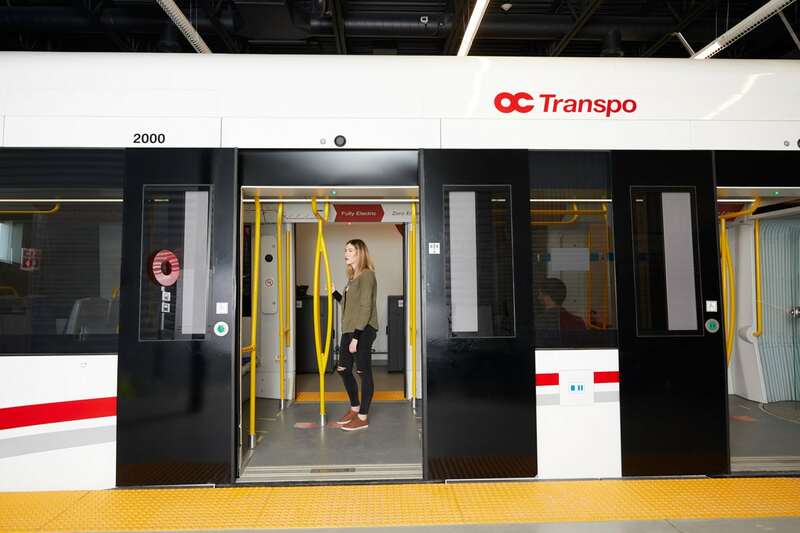 “There’s the passenger intercom [located throughout each train car] and if someone alerts me to a situation using this, I then radio control and OC Transpo has special constables who attend to that. What can you do (or not do) while driving? “Just like a bus, you have to be alert at all times. You can’t be using any phones, radios, etc. When you’re in the cab, your focus is on the train’s movement and the safety of the passengers. What kinds of weather could shut the train down? “There’s no weather condition that I’m aware of where we’d stop the train. What will you miss (or won’t) about driving a bus?